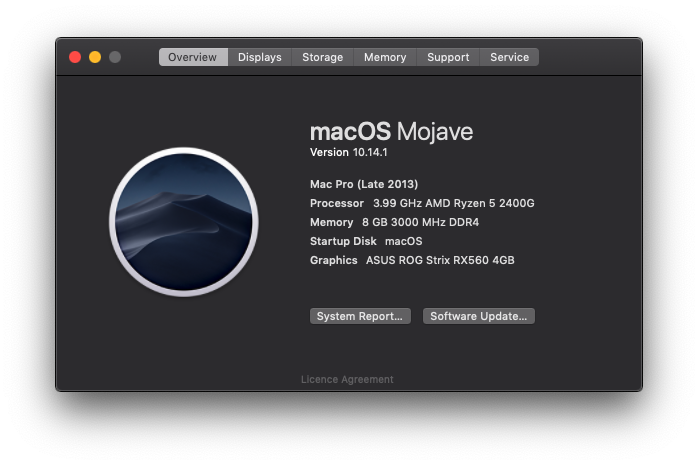 This guide will walk you through creating a Vanilla USB installer for Mojave 10.14.1 on AMD systems. Note: Nvidia GPUs that require the Web Drivers will not function on Mojave. There is some dispute between Apple and Nvidia. Please PM me with mirrors made from this link. 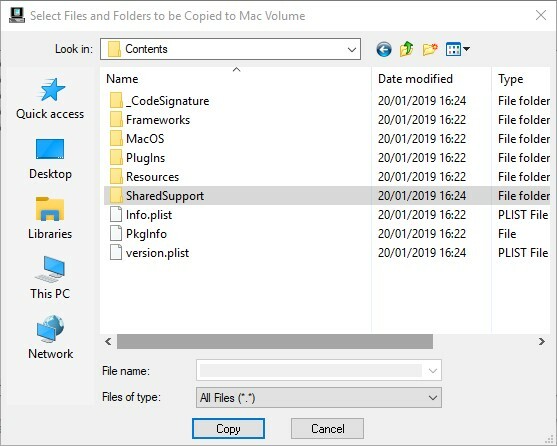 Once you've downloaded the install Application extract the archive using 7-Zip and copy the SharedSupport folder to your Desktop as that's all you'll need. 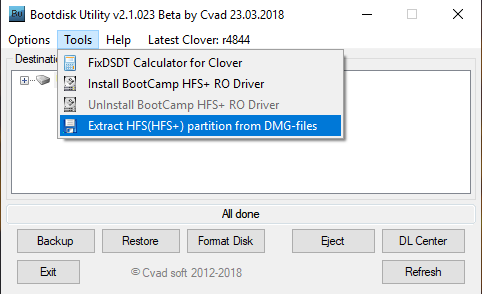 Now you need to format the USB using BDUtility and install the latest Clover Version. 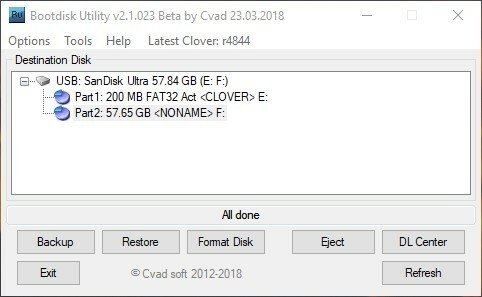 Run BDUtility and go to Options > Configuration and click on Check It to update the Clover version. Click OK.
Now with the USB highlighted click on Format then Ok.
Now extract 4.hfs from \SharedSupport\BaseSystem.dmg with BDUtility. 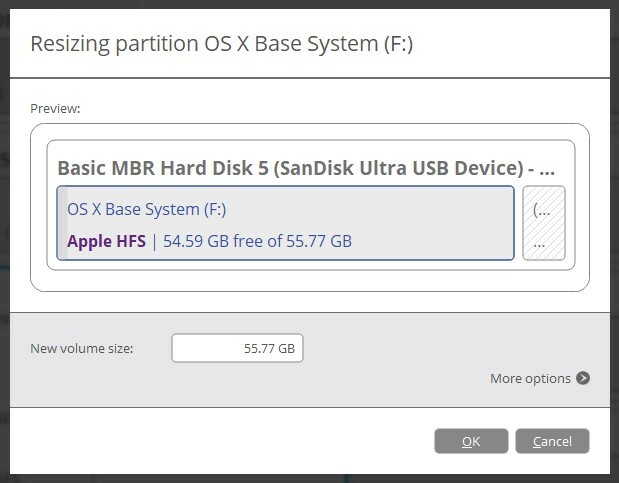 Click on the Part2 partition and click Restore. Now select the extracted 4.hfs file and let it restore to USB. Once completed open Paragon Hard Disk Manager. Click OK then Apply in the top left of the main Window. Once done you can close the Hard Disk Manager and open up TransMac. Right click on TransMac and Run as Adminstrator. Now locate the USB drive in the TransMac sidebar and navigate to OS X Base System/Install macOS Mojave.app/Contents. Now in TransMac right click on a blank space in the Contents folder and select "Copy Here" then locate the SharedSupport folder and select Copy. Once that's done you need to configure Clover and copy some AMD files. Using Windows Explorer navigate to the CLOVER partition of the USB and go to EFI > CLOVER. 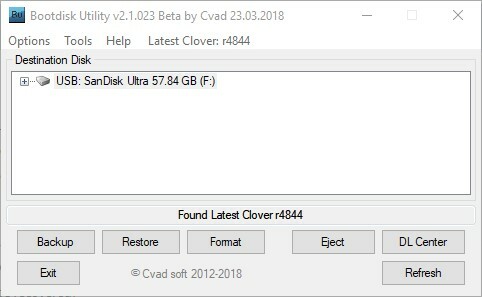 Copy the contents of the attached CLOVER.zip at the bottom of this post to that folder replacing what's already there. Now rename prelinkedkernel.amd to prelinkedkernel and copy it to the same folder. You can now boot the USB to the installer. Once booted open Disk Utility, once open click the dropdown on the top left and change to show all Devices. Now format the drive you wish to install Mojave to and name it macOS. Once formatted quit Disk Utility and run the installer installing to the macOS drive. Now reboot and when you get to Clover this time boot to the volume titled "Install macOS from macOS". You can now reboot and boot the macOS drive and be welcomed by macOS Mojave. you will reach Data & Privacy screen again so click next to proceed ( dont worry, it wont reboot now ) and so after few clicks you will reach Desktop . Finally delete this Temp User account by going into System Prefrences -> User & Groups. Hello. Thanks for the guide. I encounter a problem where when I am in Mac os and I hit a key, it types it 10+ times. I'm not able to do the commands near the end because of this. Please help. Thanks a lot for this guide ! One more question which I really concern. I am using 10.13.6. I am looking forward to at least 10.14.2, because of the original shuangpin typing method updated. Will we get a update (from 10.14.1 to higher) which is similar to the update from 10.13.2/3 to 10.13.6. 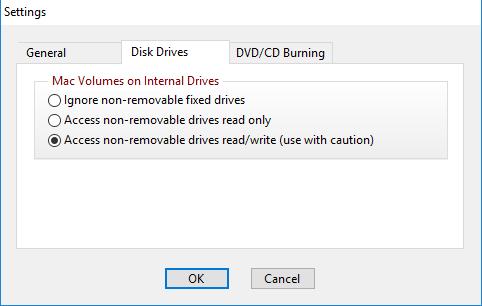 I don't want to do the long time installation from USB twice. Thank you. If you have USB issues try adding GenericUSBXHCI to the Clover > Kexts > Other folder. Only 10.14.1 is supported with the current kernel. No AMD iGPU is supported and most likely wont ever be. But question, does Mohave kernel support FX cpu? Just installed high Sierra on my pc with fx-6300 and hd6670, should I move to Mojave? Yes FX is supported. USB may be an issues but it certainly runs. A few members on Discord have it running. Quick question. Currently entering the following terminal commands but they come back with directory doesn't exist (yes I did copy the files over). Perhaps I am entering the codes wrong... There is only 2 requests right?